Floyd Mayweather Jr. has joined Khabib Nurmagomedov in talking up the possibility of a money-spinning bout. Nurmagomedov defeated Conor McGregor at UFC 229 to retain his lightweight title, although the victory was overshadowed by post-fight incidents in which the two were involved in clashes with members of the opposing camps. And the Russian has received various offers as he waits to learn of possible penalties, with Curtis '50 Cent' Jackson set to meet the 30-year-old over a possible Bellator fight. Nurmagomedov was also filmed at an event on Saturday as he appeared alongside Leonard Ellerbe, the chief executive of Mayweather Promotions, and challenged Mayweather to a bout. The boxer has now responded, addressing potentially interested parties and pointing them in the direction of Ellerbe's social media channels, where the video was posted. 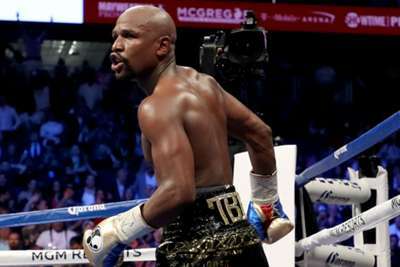 "CBS, Showtime and MGM Grand, get the chequebook out," Mayweather posted on Twitter. "Go to Leonard Ellerbe's page to view Khabib Nurmagomedov challenging me." While Nurmagomedov has a perfect 27-0 record in UFC, Mayweather improved his own record to 50-0 in the ring when he defeated McGregor last year. UFC president Dana White revealed last year that he had held talks with Mayweather about the possibility of the American entering the octagon for a future mixed martial arts fight.